If you visit Gilford's Village Store on any given week day between 7 and 9 a.m. you are sure to encounter the "regulars", a faithful group of men and an occasional woman or two who gather for their morning cup of coffee and friendly, often animated conversation about sports and local politics. A scene that is likely repeated in country and village stores all over New Hampshire. It's a good way to start the day and one that has been tradition in the village store for many years. That the store is an important part of our community was apparent by comments heard when in December of 2000 the store was closed "for the winter" and there was some doubt as to when and if it would reopen. It was obvious that the store had a place in the hearts of the people of Gilford and it was a relief to all when in January 2001 present owner Norm Soucy and his family leased and later bought the store, continuing its now 161 years of history. There is some question as to the year a store opened on the present site, but deed research seems to indicate 1836 as the year that construction began on the building which we know as the present village store. At that time a store was established by Benjamin Jewett, Jr., Albert Chase and Jeremiah Thing who, unfortunately, by 1843 were declaring bankruptcy. The store was quickly taken over by George W. and Benjamin Weeks, who were later succeeded by George and John Munsey. The Munsey family held the store for about 37 years, the longest period of ownership in its history. The second longest period of ownership was that of the Wadleigh (Wadley) family who operated the store from 1898 to 1922 when Nettie Wadley conveyed the property to Willis Gove. The portraits of both Munsey and Wadley hang in the hallway of T-AHS's Grange building. There have been about 20 owners of the store with the proprietor lasting an average of 8 years. The country store of the past served a much smaller population than we are accustomed to in present day "small" towns such as Gilford. Alan Whitney, whose family owned the store from the mid 1950's to 1963, remembers that in 1941 when his family came to town the population numbered 740 people. In addition to being the primary trading center (there was at one time 3 stores operating in the village) it was, as has been noted , a general gathering place for exchanging information, the store often serving as the town's post office. Gilford's historical society has a revolving "post office" that holds slots for about 30 names and sat on a store counter, probably of Wadleigh's era. Sometimes a town's only phone was located in the store. In one form or another, "news" was a commodity of the village store. Space in the village store was used for a number of other purposes as well. In the 1840s, Dr. Dearborn, a new physician in town, maintained an office and a bedroom on the second floor of Munsey's Store. And in the 1850s according to Alvah Hunter, "the hall over the back of Munsey's store housed a shoe shop" where a somewhat rowdy element worked - and played cards! This hall was also used for the occasional public entertainment. Hunter remembers a rousing Indian performance, complete with a war dance, a battle and a very realistic scalping that sent shivers down his spine. For a number of years a sign hanging in front of the store proclaimed "Wadley's Store and Grange Hall." The Mt. Belknap Grange used the 2nd floor hall for a number of years before it moved across the street into the Morrill Store , a competitor of Munsey. Eventually this store, unable to turn a profit, closed and later became the permanent home of the Grange. Gilford's Thompson-Ames Historical Society, now owner of the Grange building, maintains a store exhibit area in what was the John Morrill store. Over the years the appearance and character of the store has changed, Porches were added and removed and added again, additions were put on and gasoline pumps installed. However, essentially little has changed of the main building. It still retains its 1870 storefront with its pedimented gable and centrally- positioned door, flanked by four large panes of glass. The uneven wooden floor shows the wear of the comings and goings of hundred of customers. 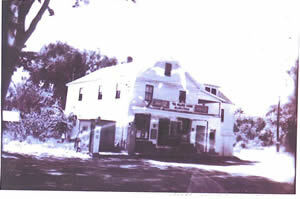 When you visit the Gilford Village Store, you know you are visiting a building with a history. Whitney estimates that in the 1950s there were about 125 farms in Gilford. His family's store was a fully stocked store - with fresh meats and produce on a daily basis. However, the emerging supermartkets made it difficult to compete and it was around this time that the character of the country store changed to the convenience store as we know it today. However, Soucy disputes this characterization. He says the village store is more than a convenience store. It is a community store and a big part of the community. He has put his finger right on it. The storekeepers and the goods might have changed and the building goes through periodic alterations in an effort to meet customer's needs, but it is the feeling and the atmosphere that doesn't change. The neighborliness, the friendliness and the willingness to accommodate the community is a constant. This is what preserves the tradition. What the town learned when we thought we might be going to loose it was that Gilford needs and wants a village store.